The last three weeks I have had no chance to do any other bits I have on my list to complete the conversion. The van has been visiting the van doctors though, for minor surgery. First time was for a break check up. After visiting two tyre places locally to see about getting the handbrake sorted (lever had too much travel) both told me I would likely need new discs and pads all round. 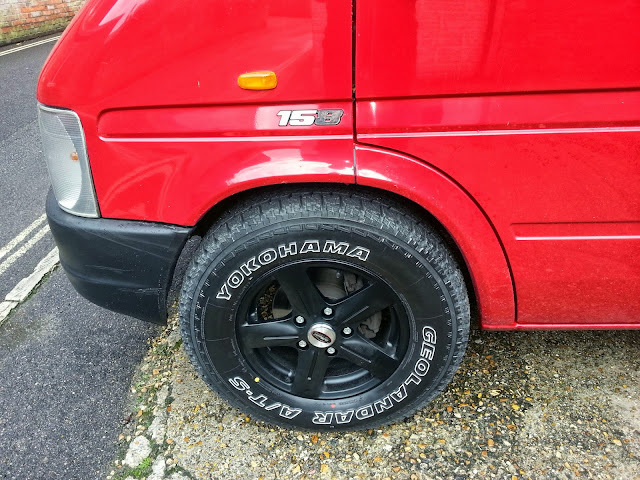 I took it into Dunnings Automatics Ltd in Weymouth, which is the place that diagnosed the last van with auto-gearbox death and were very honest about it all. So I took Pazuzu in expecting a bill towards £500. After work I went to pick it up and the bill was ten times less than expected, all that needed doing was the handbrake adjusted, they said the discs are quite new on the front, pads all round are newish and there was still a good 5000miles that I should get out of the rear pads. How many garages are there that are as honest as that? Maybe a lot are, I would suspect there are just as many that would have charged for new pads and a couple of hours labour and left me none the wiser. I recommend them to anyone, they are a small family business and really helpful. I feel guilty for not going to my old mechanic (he recommended Dunnings for the automatic gearbox repair originally) who also was great, but this van wont fit in his workshop, and he is a one man unit and usually booked up for the month! Next job was to get the MOT, it failed due to number plate bulbs and the tow bar electric hookup not having a cover. The reason was that someone could get electrocuted from an uncovered hook up, I find this very unlikely as I took the fuse out ages ago as I never use it. They put a bit of tape over the casing, sorted out the lights which ended up being the spring connector in the door not touching the contacts, and it passed. Next job was to get rid of the slight knocking from the front over rough roads (most roads in England! ), this was either coming from the drop links or the anti roll bushes so I had them replaced, and plugged into the VAGCOM. Nothing serious came up on there and it was cleared. Dunnings also arranged to get the tracking done, the great thing about them is even if they cannot do it they get it done by trusted local places (MOT and Tracking...). Now it doesnt pull slightly to the left as it did. Today I journeyed over to TopGear Bridport for my wheels to be fitted. They were the cheapest ones I could find, and there is not much choice for this van that has a good load rating. Even a lot of the more expensive ones that fit had a load rating I wouldn't want to trust so I opted for the cheaper ones (rated to 1150kg). Luckily the factory (Team Dynamics) had some unpainted in stock, so they ordered Satin Black for me along with some Yokohama Geolander tyres. These are a fair bit bigger than the old ones at 16in 225/75. The front bumper needed a trim and occasionally I can hear a tiny rub on the drivers side wheel arch through a sharp right hand turn, this is just from the very edge of the tyre which will wear back quite soon so I am not worried about it. The ride is a lot smoother, even over British A roads full of repairs and pot holes there is hardly a bump to be felt. Also the speedo now reads correctly, it did under read by about 8%. Most importantly they really go well with the van, the big chunky tyres and black alloys finish it off well. Next on the list to do is join up the decat stainless section that is already fitted with a new stainless tail section, probably with a twin side exit just in front of the rear wheel. It needs a new back section anyway as I have patched it up in two places due to rust, for a little more stainless comes with a lifetime guarantee. Inside I have matched the rear speakers that I put in with some upgraded 10cm fronts from Rockford Fosgate, still quite cheap but the sound is great. Next month is insurance month, already been quoted £190 so quite chuffed with that, following month is Tax which is a much lower bracket than the old van. Best news is now after 3 weeks of work I still have fuel left in the tank, which is smaller than the Caravelle tank by about 12litres and that would be well past the red light warning by now. So all in all, bigger is definitely better in this case. Kat unfortunately is working most weekends so I dont get the chance to go camping as often as I want, hopefully we will get some luck soon and can change our lifestyles a bit. I think that may mean me moving out of teaching though, and to be honest I wont miss it. I will miss helping students and seeing them achieve but the current policies in education are likely to send the whole industry into the same hole banking is in. If we force feed kids to sit exams earlier and earlier they will lose all passion for learning in my opinion, I did not become a teacher to do that. I have been looking at jobs outside teaching over the past two weeks but most would force me to move away from the coast, I would rather live as a beach bum than do that though. 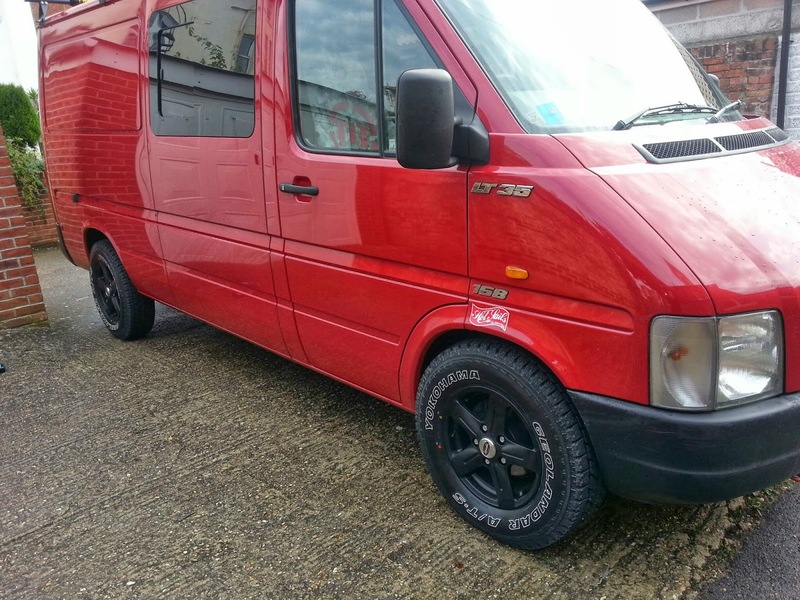 Hi, think the van looks great with the 4x4 style tyres.